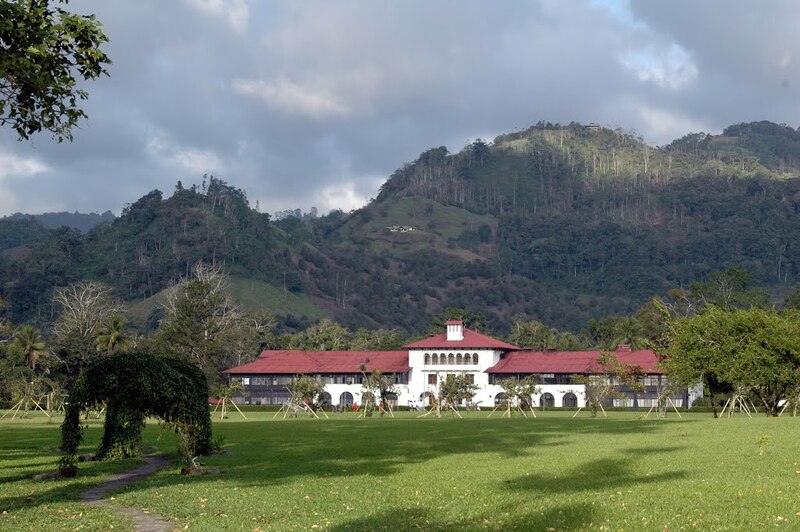 GUEST BLOG / By Lynne Banker, WEAVERS COFFEE BLOG-- At the Center for Tropical Agricultural Research and Education (CATIE) in Turrialba, Costa Rica, you can touch the history of coffee — and also, if the optimists have their way, part of its future. Here, spread across 25 acres, are coffee trees that take you back to coffee's origins. "The story starts in Africa, no? East Africa," says Eduardo Somarriba, a researcher at the Center for Tropical Agricultural Research and Education, CATIE in Turrialba, Costa Rica, as we walk through long rows of small coffee trees. These trees came directly from forests in Africa. Each one is identified by number, and its origin is recorded in a catalog. Carlos Cordero, another scientist here, chooses one tree at random and looks it up. It shows that the seed that grew into this tree came from the highlands of Ethiopia, near the city of Jimma. Scientists from the U.N.'s Food and Agriculture Organization collected that seed and brought it here to CATIE in June 1965. This tree is from the species Coffea arabica, the most commonly grown coffee species. But not far away, CATIE also has samples of another species — Coffea canephora, often called robusta coffee. The robusta trees are bigger. They're also hardier than arabica plants. Such trees are widely grown in Vietnam and parts of Africa, typically at lower altitudes than arabica trees. But robusta coffee has a bitter taste, and some coffee purists look down on it. CATIE's collection is like a botanical storage vault, preserving a piece of coffee's ancient and wild African past. They're collected from places where such trees have grown since prehistoric times, evolving a whole spectrum of different genetic forms. In most of the world, you can't find such variety. Today's commercial coffee production is based on only a tiny slice of it. Over many centuries, humans selected a few favorite coffee trees for their use. Arab traders brought them from Africa to the Middle East. In the 1700s, Europeans brought two specific genetic strains of Coffea arabica to Latin America. "We got the Bourbon and also the Typica line, and then combinations between these two," says Somarriba. Those two types of trees — just those two — are the ancestors of much of the coffee in Latin America and even in the world. In fact, there's a lot more genetic variety in this one little field at CATIE than there is in all the coffee plantations of Central America and South America — and that's a problem. This genetic uniformity of cultivated coffee makes the industry more vulnerable to shocks like a changing climate, or disease. The industry has put all its eggs, so to speak, in one genetic basket. Right now, one disease in particular is devastating coffee fields across Central America and parts of South America. It's called leaf rust. The damage is obvious. Emilia Umana, a coffee expert who works for the company ECOM Trading, stops her car in the middle of a lonely road in the Tarrazu region of Costa Rica and points toward a mountainside right ahead of us. "See how many trees don't have leaves anymore? That's leaf rust," she says. The entire field seems to have been stripped bare. Those fields won't produce a harvest this year. 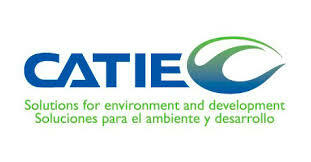 Several countries, including Costa Rica and Guatemala, have declared it a national agricultural emergency. Millions of farmers are looking for answers. One potential answer could involve breeding new varieties of coffee that can fend off the disease. A few such varieties already exist and increasing numbers of farmers are turning to them. Umana stops her car again to show me an example. "Look at those plants," she says, pointing to a few with orange spots on their leaves. "That's leaf rust. And see the other ones, that don't have any? Those are leaf rust-resistant plants." The variety is called Catimor. Umana says that if she were a farmer, she'd only grow such trees. "I love them. They're really tough. They're like the John Deere of coffee! Unfortunately, Catimor is not a perfect solution. In fact, some people say it could be the downfall of coffee. One of its grandparents is from the robusta side of the coffee family, and you can taste that robusta bitterness in its beans. Researchers are hoping to create something better — a plant as tough as Catimor, with beans sweet enough for any taste test. Maybe what they need to fight leaf rust — or to adapt to a warming planet — are genes that lie concealed in the collections of coffee trees at CATIE. It's also possible, says CATIE's Somarriba, that genetic solutions could be found in the forests of Africa, where coffee grows wild. "We have to really go back to the forest, capture what is in the wild, bring them into the science, to somehow save this genetic variability," he says. Up to now, money for such efforts has been scarce. Very few of the coffee trees in CATIE's collections have been studied carefully and their genetic makeup analyzed. Even less effort has gone into studying the many coffee species, relatives of arabica and robusta, that aren't even grown commercially. Somarriba says tropical trees have been neglected. "Coffee and cocoa — some people call them orphan crops. We have an international center for wheat and maize, but we don't have one for coffee," he says. 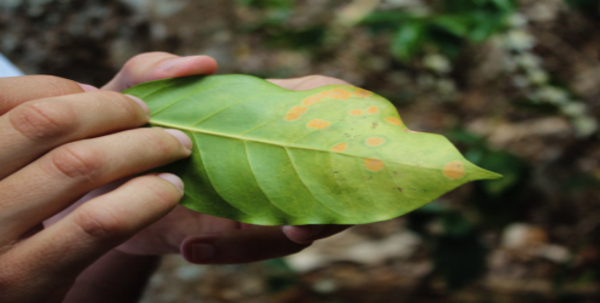 Some people in the coffee industry now are trying to end this neglect — and not just to fend off threats like leaf rust. These seedlings at CATIE (multiplied through advanced laboratory techniques) represent a new experimental line of coffee that's resistant to leaf blight. Peter Giuliano, from the Specialty Coffee Association of America, says the genetic storehouse at CATIE, or in African forests, may also contain treasures of taste. "One of the biggest stories of the last five years in the coffee industry is the discovery of a variety called Geisha," he says. 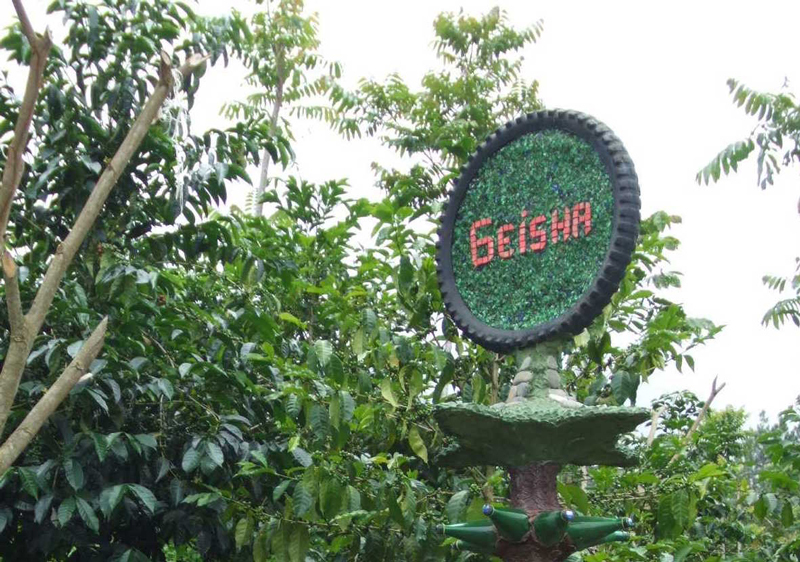 Geisha was part of CATIE's collection of Ethiopian trees, in fact. Seeds from that tree found their way to a farm in Panama, and a few years ago, by accident, coffee connoisseurs found that this variety, grown in that environment, had a unique and wonderful taste. It quickly became "a rock star in the coffee world," says Giuliano. It sold for incredible prices at auctions. Earlier this month, Giuliano organized a big meeting of the Specialty Coffee Association focused on coffee genetics. Some of the biggest names in the high-end coffee business gathered to learn about leaf rust, conserving what's left of forests in Ethiopia and breeding new varieties. Giuliano says it was a heavy dose of science for a roomful of business people and coffee lovers, "but everyone was up for it, and really inspired. And now we can make good decisions about how to grapple with these problems that we're facing." They've already made one decision. 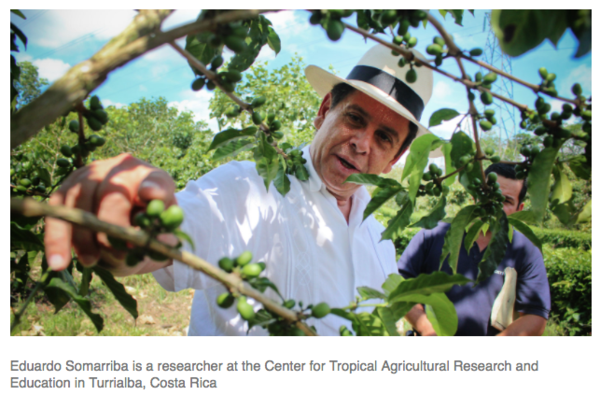 Many coffee roasters, are helping to fund a new scientific effort called World Coffee Research. One of its first projects will be a genetic analysis of CATIE's coffee collections.